Background: Pneumonia in children is a leading cause of morbidity and mortality in developing countries. It is often complicated by Congestive Cardiac Failure (CCF), with some of the symptoms similar to those of pneumonia. Brain Natriuretic Peptide (BNP) assay can differentiate cardiac from respiratory-related causes of respiratory distress. Objective: To determine the role of BNP in differentiating isolated pneumonia from pneumonia complicated by CCF. Methods: Over a 12-month period, consecutive children with radiologically-confirmed pneumonia were recruited for the study. Those with complicating CCF were noted. All the children had blood BNP assay done by ELISA, prior to treatment. Biodata was obtained and the children were grouped into those with isolated pneumonia and those with pneumonia complicated by CCF. Results: Fifty children were recruited; of these 26 (52.0%) had isolated pneumonia while 24 (48.0%) had pneumonia with CCF. The median age of the children was 6 months. The median BNP values for the isolated pneumonia group (229.4 ng/l), was significantly lower than that of pneumonia complicated by CCF group (917.3 ng/l); (p = 0.007). ROC showed that a BNP value >550ng/l could identify children with pneumonia complicated with CCF from those with isolated pneumonia with a sensitivity of 70.4% and specificity of 63.4%. Conclusion: A BNP assay prior to treatment of >550ng/l can differentiate children with pneumonia complicated with CCF from those without CCF. 1. Rudan I, Tomaskovic L, Boschi-Pinto C, Campbell H, for the WHO CHERG Reference Group. Global estimates of the incidence of clinical pneumonia among children under five years of age. Bull World Health Org 2004; 82: 895–903. 2. Bryce J, Boschi-Pinto C, Shibuya K, Black RE for the WHO CHERG. WHO estimates of the causes of death in children. Lancet 2005; 365: 1147–52. 3. Black RE, Cousens S, Johnson HL, Lawn JE, Rudan I, et al for the WHO CHERG. Global, regional and national causes of child mortality in 2008: a systematic analysis. The Lancet 2010; 375: 1969 – 87. 4. McMurray JJ, Adamopoulos S, Anker SD, Auricchio A, Böhm M, Dickstein K, Falk V, et al. ESC Committee for practice guidelines: ESC guidelines for the diagnosis and treatment of acute and chronic heart failure 2012. The Taskforce for the diagnosis and treatment of acute and chronic heart failure 2012 of the European Society of Cardiology. Developed in collaboration with the Heart Failure Association (HFA) of the ESC. Eur Heart J 2012; 33: 1787–847. 5. Sadoh WE, Okperi B, Ikhurionan P, Monday P, Sadoh AE. Evaluation of predictors of mortality associated with childhood heart failure in Nigeria: a two-center study. Pediatr Emerg Care 2018. Published online Feb 5 2018. DOI: 10.109/PEC000000000001427 [Epub ahead of print]. 6. Lagunju IA, Omokhodion SI. Childhood heart failure in Ibadan. West Afr J Med 2003; 22: 42–5. 7. Osarogiagbon WO, Sadoh WE. Outcome of pneumonia in children presenting to the University of Benin Teaching Hospital, Nigeria. South Afr Resp J 2013; 19: 117–20. 8. Ross RD, Bollinger RO, Pinsky WW. Grading the severity of congestive heart failure in infants. Pediatr Cardiol 1992; 13: 72–5. 9. Omokhodion SI, Okolo CM, Obetoh C, Abowheyere J. Proposed severity index score (SIS) scheme for childhood heart failure. Abstract of the 4th World Congress of Heart Failure: mechanism and management; Jerusalem, Israel, May 26 – 29 1996. Abstract 763. J Cardiac Failure 1996; 3. 10. Yasue H, Yoshimura M, Sumida H, Kikuta K, Kugiyama K, Jougasaki M, et al. Localisation and mechanism of secretion of B-type natriuretic peptide in comparison with those of A-type natriuretic peptide in normal subjects and patients with heart failure. Circulation 1994; 90: 195–203. 11. Hunt PJ, Richards AM, Nicholls MG, Yandle TG, Doughty RN, Espiner EA. Immunoreactive amino-terminal pro-brain natriuretic peptides (NT-proBNP); a new marker of cardiac impairment. Clin Endocrinol 1997; 47: 287–96. 12. Mair J, Friedl W, Thomas S, Puschendorf B. Natriuretic peptide in assessment of left-ventricular dysfunction. Scand J Clin Lab Invest Suppl 1999; 230: 132–42. 13. Morrison LK, Harrison BS, Krishnaswamy P, Kasanegra R, Clopton P, Maisel A. Utility of a rapid B-Natriuretic peptide assay in differentiating congestive heart failure from lung disease in patients presenting with dyspnea. J Am Coll Cardiol 2002; 39: 202–9. 14. Olusanya O, Okpere E, Ezimokhai M. The importance of socioeconomic class in voluntary fertility control in a developing country West Afri J Med 1985; 4: 205–12. 15. Sadoh WE, Osarogiagbon WO. Pneumonia complicated by congestive cardiac failure in Nigerian children. East African Medical Journal 2012; 89: 322–6. 16. Osarogiagbon OW, Sadoh WE. 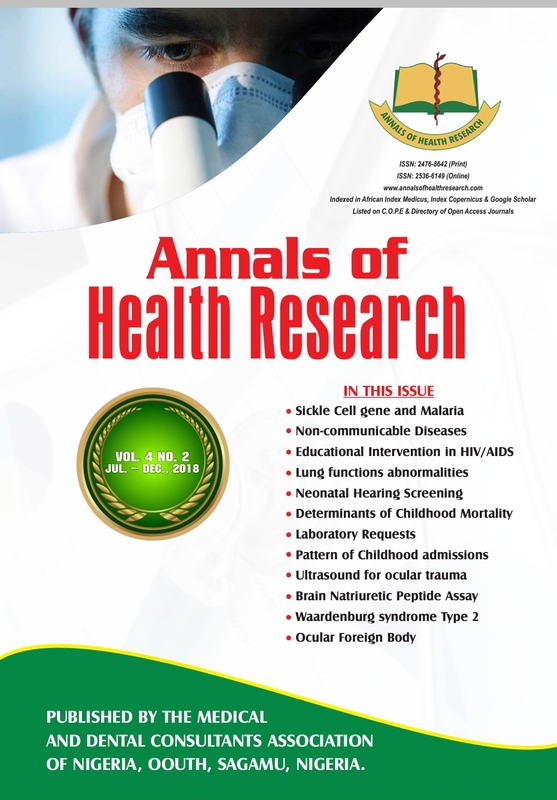 Socio-economic and socio-demographic determinants of BNP values in children with pneumonia in Benin City. Australasian Med J 2017; 10: 432–8. 17. Hu D, Liu Y, Tao H, Gao J. Clinical value of plasma B-type natriuretic peptide assay in pediatric pneumonia accompanied by heart failure. Expt Therap Med 2015; 10: 2175–9. 18. An JD, Zhang YP, Zhou JH. Levels of serum brain natriuretic peptide in children with congestive heart failure or severe pneumonia. Zhongguo Dang Dai Er Ke Za Zhi 2006; 8: 201–4. 19. Li J, Ye H, Zhao L. B-type natriuretic peptide in predicting the severity of community acquired pneumonia. World J Emerg Med 2015; 6: 131–6. 20. Doust J, Lehman R, Glasziou P. The role of BNP testing in heart failure. Am Fam Physician 2006; 74: 1893–8.